Our study of the eulogy brings us to this short piece of perfection delivered by Actors Studio director Lee Strasberg at actress Marilyn Monroe's funeral in 1962. We are lucky to be able to hear a full recording here. Strasberg barely got through his own closing paragraphs, which makes them all the more moving. Here's what he said: ...I am truly sorry that the public who loved her did not have the opportunity to see her as we did, in many of the roles that foreshadowed what she would have become. Without a doubt she would have been one of the really great actresses of the stage. Now it is at an end. I hope her death will stir sympathy and understanding for a sensitive artist and a woman who brought joy and pleasure to the world. I cannot say goodbye. Marilyn never liked goodbyes, but in the peculiar way she had of turning things around so that they faced reality - I will say au revoire. For the country to which she has gone, we must all someday visit. "Somewhere Over the Rainbow" was played, as well as a portion of Tchaikovsky's Sixth Symphony (scroll to minute seven of this link to hear it). Tchaikovsky's melodic lament, said to be be a cry of love for his dashing nephew back in 1893, seems an appropriate farewell to a screen goddess, and had been repositioned as a doo-wop tune in 1960 by Little Anthony and the Imperials, placing it in the social atmosphere at the time of Monroe's death. 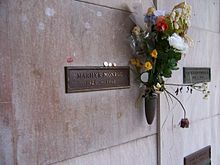 Monroe's body was made viewable (though one of her best friends was her make-up artist who understandably was collapsed in emotion as he placed a wig on her head and helped to make her look more presentable). She was placed in an open heavy bronze casket, wearing this green Pucci dress, hands grasping pink tea roses from Joe Dimaggio who planned the entire service and didn't allow any Hollywood stars or hangers-on to attend.